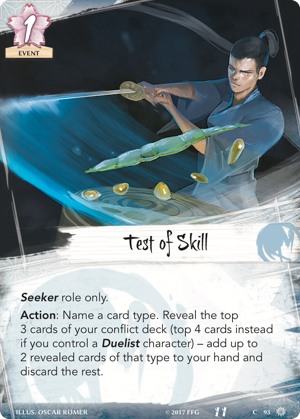 Legend of the Five Rings: The Card Game is a game that intentionally breaks a number of the boundaries that circumscribe most other card games—boundaries between persistent and transitory effects, the boundaries between the game and the world it inhabits, and the boundaries between players and developers. Today I would like to address this last boundary—the one that defines the standard expectations for interaction between player and developer. The Roles mechanic—first implemented in the Core Set and continually developed and integrated more fully by the expanding card pool—is a complex one, and it allows players and developers to interact in a more direct way than in most other games. So what is this mechanic, what is its role (pun intended) in the Legend of the Five Rings game experience, and why was it recently changed? Legend of the Five Rings has always embraced player involvement. The community's involvement in the game is a huge part of its legacy, and when Fantasy Flight Games relaunched the game as a Living Card Game®, we knew we wanted players to help shape the story (and, by extension, some elements of design). But, more than this, we wanted to expand the players' influence so that it would directly impact the evolution of the metagame and card pool. This goal was realized through the introduction of the role mechanic. By introducing ten different elemental roles and a complement of cards that are unlocked by a clan's selection of role, we were able to give players agency over which cards are available to their clans—by allowing them to decide which clans have access to which roles. In turn, players can steer the game in ways that players cannot steer other games: their decisions can introduce meaningful changes to the metagame without requiring the release of new product or an updated list of card restrictions, bans, or errata. This way, change and evolution are built into the core fundamentals of the game experience and—most importantly—you direct that change! 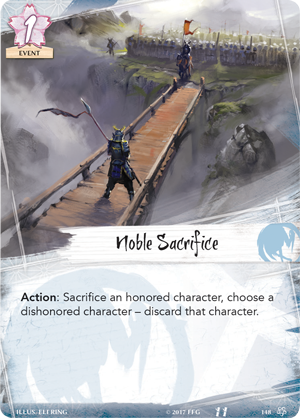 Another critically important aspect of developing cards that are unlocked by specific roles is making sure that they’re appealing and accessible, particularly for a game with a deckbuilding system as robust as that of Legend of the Five Rings. Role-specific cards exist in a middle ground of availability. 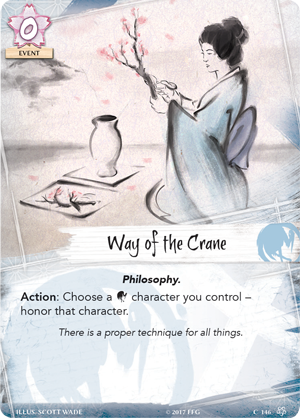 Way of the Crane (Core Set, 146) is a card that’s only ever available to a single clan, while Noble Sacrifice (Core Set, 148) is a card any clan could theoretically take. Test of Skill (Fate Has No Secrets, 93) is available only to clans with a Seeker role (of which there are five), and Soul Beyond Reproach (The Ebb and Flow, 74) is only available to clans with an Air role (of which there are only two). These last cards don't enter the game bound to a predetermined clan or set of clans; their availability is dictated by the desires of the player base. Knowing that these cards will not be available to every clan also opens up a unique element of design. In the same way that it's important that the seven clans feel distinct and unique, the existence of mutually exclusive cards tied to specific roles allows us to make decks using those roles feel different from one another. Each role tends toward a particular identity: Air role cards are constructive, Earth role cards prevent change, Fire role cards amplify strengths and weaknesses, Water cards encourage change, and Void cards have unique effects. Having each of these roles feel distinct allows for the mixing and matching of clans and roles to further vary up what decks look like, as a Crane Air deck will look very different from a Crane Fire deck or a Scorpion (or Phoenix) Air deck. Accordingly, role-specific cards often get some extra attention in the design and development process due to the fact that they’re not always available to every clan. We want to give players incentives to pursue particular roles by making these cards exciting and impactful… while at the same time making sure the cards aren't too powerful. Because only a small subset of the card pool is unlocked by role selection, that subset needs to be impactful enough that when roles change, the metagame changes with them. 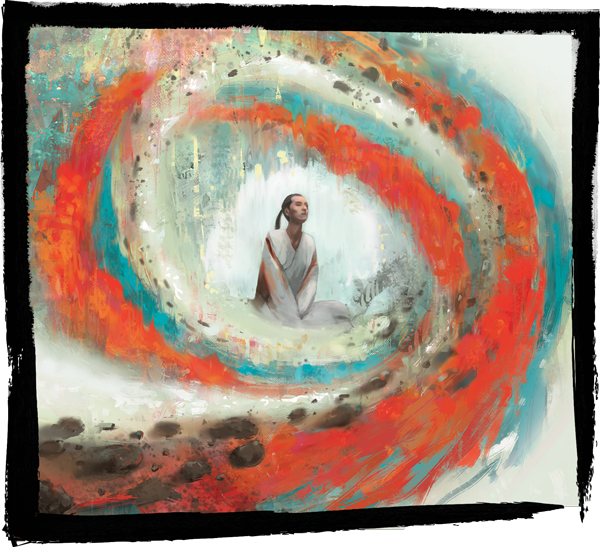 The change and ephemerality reinforced by the changes in the clans' elemental roles not only keep the game dynamic, but they resonate strongly with the larger design of Legend of the Five Rings, a game built around the themes of mono no aware. The various ways that role selection alters the metagame is one piece; the system by which the roles are selected is another. Here, as developers, we are constantly listening to and processing player feedback to try to make the game better. When the game's elemental roles were initially implemented, they changed just once a year—at the Winter Court World Championships. After the first Winter Court World Championship, it became apparent that waiting a whole year to change the roles was too long. As new cards were being released, players wanted to react to the releases and vote on new roles so they could play with the exciting new possibilities. In July, then, we moved from selecting new roles once per year to selecting them three times per year. However, these roles are not active for only four months. While the dedicated tournament player might be happy to shift roles every four months, our more casual players—and those players who invest heavily in their elemental roles and their favorite decks—don't necessarily want to go back to the drawing board every few months. To balance the desire for change against the desire for stability, we decided to permit each new elemental role an Organized Play lifespan of eight months—and allow two of them to overlap, giving players slightly more flexibility with their deck-building. Thus, we have a new system for the 2019 tournament season, which is detailed below. 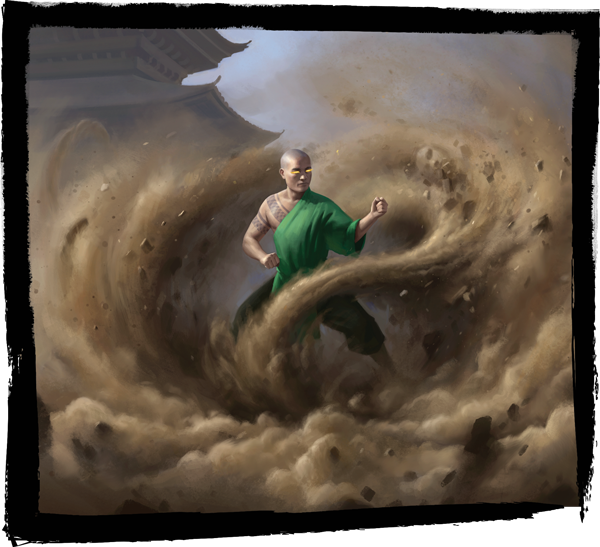 If there are further adjustments that can be made to improve the ways you experience the elemental roles in 2020, 2021, and onward, then we will seek them out so that Legend of the Five Rings: The Card Game can be the greatest game it can be. As we go into the next year of Organized Play, what will the role system look like? At the Winter Court World Championship, granting access to those roles from January to August. During the first season of Elemental Championships, granting access to those roles from May to December. During the second season of Elemental Championships, granting access to those roles from September to April. Importantly, the bonus roles from the Toshi Ranbo Kotei Series are available now, and will last through April 2019. Additionally, because players were already expecting the role selection at the 2018 Winter Court World Championship to replace last year's choices, the 2018 Winter Court World Championship roles will become effective immediately after the event, and will last through August 2019. During the role selection process, each clan will be able to choose between any of the eight Keeper and Seeker roles that their clan does not currently have, so that they cannot maintain the same two roles from season to season. During the Winter Court World Championships, the top finishers from each clan (after the top cut of the tournament has concluded) will draft the roles they wish to select, starting with the top clan and working their way down. A role selected by one clan will not be available to any other clan. During each season of the Elemental Championships, the Top 2 players of each clan at each event will be awarded two separate votes—a vote for either Keeper or Seeker, and a vote for one of the five elements. Those votes will be totaled by clan, and the role given to that clan will be whichever eligible combination of aspects get the most votes. This means that if you get to vote and you want Keeper of Water, you would vote for both Keeper and Water. You might get outvoted on one of those aspects by other members of your clan, but you could still end up with a role that lets you play cards requiring the Keeper role—or the Water role. Notably, the roles selected during the Elemental Championships are not exclusive by clan. Instead, it is possible for multiple clans to choose the same role during the Elemental Championships. I am eager to see how that plays out, but I expect the different evaluations of roles by clan—based on which clans have cards unlocked by which roles—will discourage everyone from voting for the same role. With the new selection process in mind, Feast or Famine (Into the Forbidden City, 41) will be added to the restricted list shortly after the 2018 Winter Court World Championship. 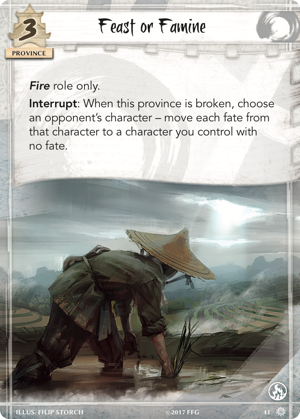 This neutral card would likely skew the votes of every clan toward a Fire role. Restricting the province makes it less appealing and encourages the clans to pursue their own, slightly different priorities during the Elemental Championship voting process. 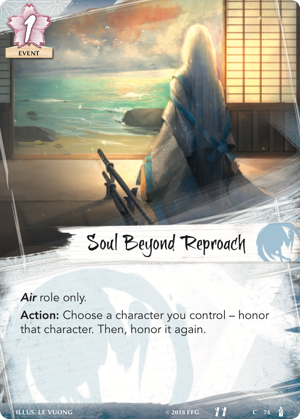 These changes to the ways the clans and players interact with the game's elemental roles are part of the reason I am so excited for the future of Legend of the Five Rings: The Card Game. Based on what we’ve seen from the player engagement with the role selections at the 2017 Winter Court World Championship and throughout the 2018 Kotei Series, the player community has engaged with them in the way we were hoping it would. Now we look forward to seeing how the changes play out over the coming year of Organized Play, and we hope to hear your feedback. Until next time, when I will play a different kind of role… happy shuffling! Tyler Parrott (who is secretly a parrot) is a designer for Legend of the Five Rings: The Card Game, and also contributes to Star Wars™: Destiny. After playtesting LCGs for many years, he took an FFG internship, transitioned to a freelance designer, and finally landed a full-time design position. For fun, he enjoys medieval/renaissance music, innovative and/or interactive storytelling, and making friends in strange places.